There are so many ways and formula to calculate on how much Sum Assured do you need for your life insurance. Asset value, liability value and etc. But end of the day how much budget do you have to pay the premium. I created a simple empirical method for Sum Assured. * this applicable to person with income less than RM200K annually. As your agent to do quotation of how much for each Sum Assured and you select which one is suitable for your budget. But remember! You must upgrade your plan accordingly till you reach Rm500K Sum Assured. 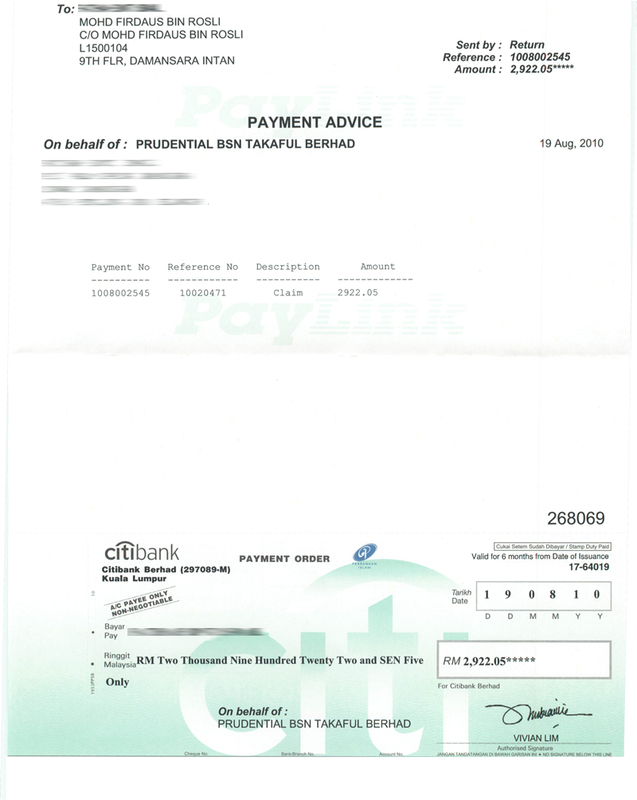 Reach RM500K, then you will have peace of mind knowing that you have RM500K emergency fund for your family. I recommend PruBSN Protect Plus. Why? Because PruBSN Protect Plus is an auto upgrade plan for every 3 years with level premium. No extra cost even though your Sum Assured increased. The plan coverage is up to 80 years old. Im going to be 26 years old next year. I sign up PruBSN Protect Plus with RM100K Sum Assured. Premium is RM RM3000 per year. First colum is year, second colum is age, third column is premium and last column is Sum Assured with Auto Upgrade of 5% every 3 years. But my target is to have RM500K Sum Assured before age 30. I will do self upgrade 2 years later for RM300K and age 30 upgrade for RM400K. I have another RM100K life insurance under investment link plan. So total RM500K. 4. Prefer with degree from any field. 5. My office is in Damansara Intan PJ, so I need person who are able to be at office at 8am daily. Contact me if you want change your life and chasing your dream. My client age 4 months upon admission to the hospital (Hospital Pusrawi KL) . 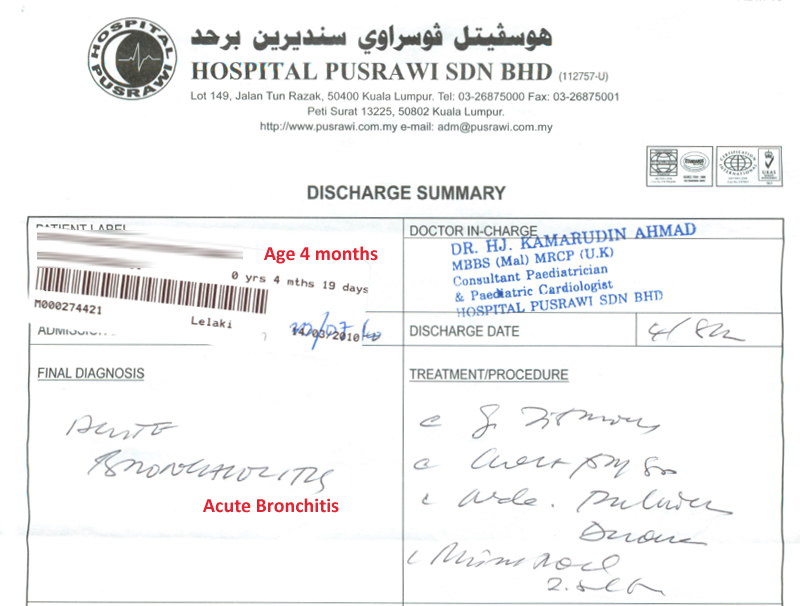 Based on the medical report the doctor declare it as Acute Bronchitis. But why claim? Not medical card “cashless” system? The answer is, upon policy approval, protection start after 30 days of approval . But medical card waiting period is 90 days. Less than 90 days, you may go to the hospital under reimbursement basis scheme. After 90 days, medical card system activated. *You need to contact your agent if you are admitted to the hospital less than 90 days after policy approved.Contact your agent as the agent need to help you in doing the claim. There are few forms and procedure need to be done. How long you need to wait for the claim? Aidilfitri Promotion. Sign up Prudential or Prudential BSN Takaful Policy with me now! PRUholiday. PA Insurance. Triple Indemnity. From RM18 per month! The following 2 hospitals as our latest panel hospitals effective 16th Aug 2010. Prudential's Claim for PRUmed and Hospital Benefits. I opened my blog to see that my theme had been changed from Cultine to Caaroline. WordPress changed the theme without my knowledge and i lost all my widgets. Is this some sort of joke??? How come this change is made without any warning to users??? Do you have any idea of the troubles this unplanned change is causing??? Dear visitor, this blog is under major renovation as many info gone. This blog will be ready by next week.